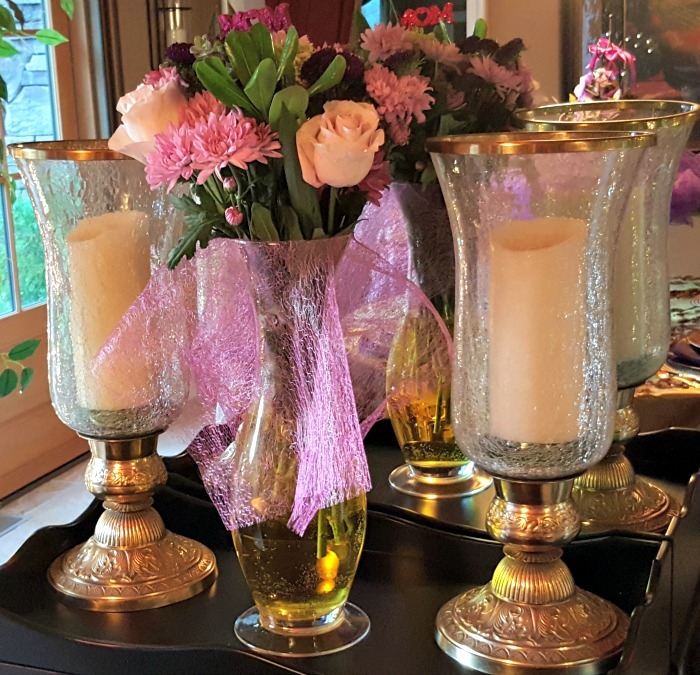 I have set a pretty table for Mother's Day, however my husband and I will be going over to my parent's house on Sunday. My dad is still recovering from surgery, so he is weak and tires easily. I am preparing brunch for the four of us. This tablecloth is actually gold, although it looks brown in the photos. Gold flatware, along with gold goblets carry out the gold look. 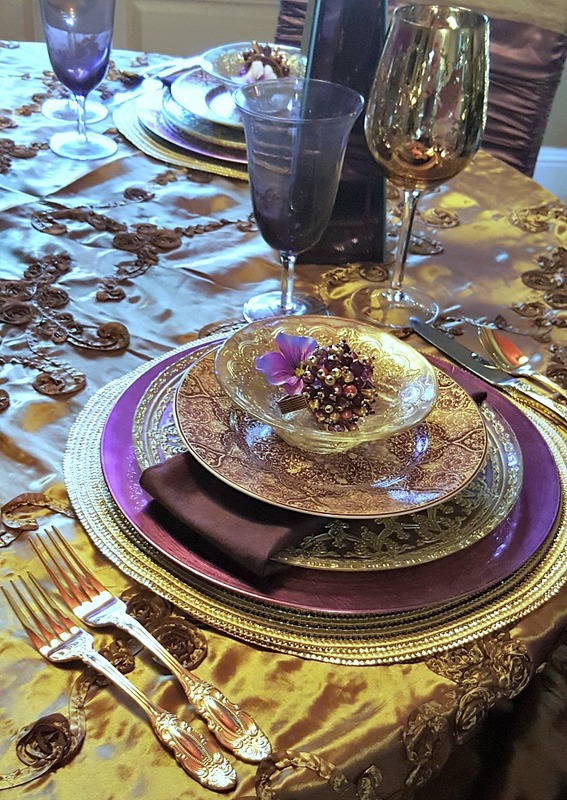 I am also using gold placemats layered with purple chargers with a gold dinner plate and bowl. 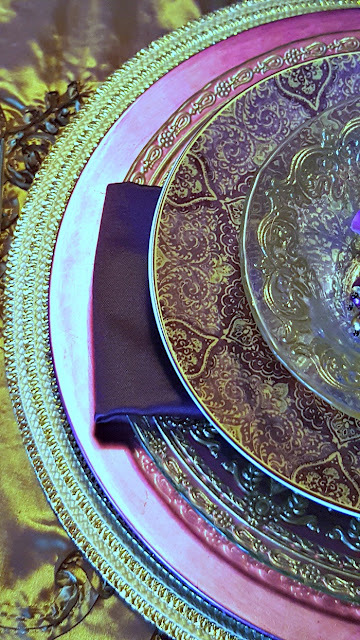 The salad plate is purple and gold. 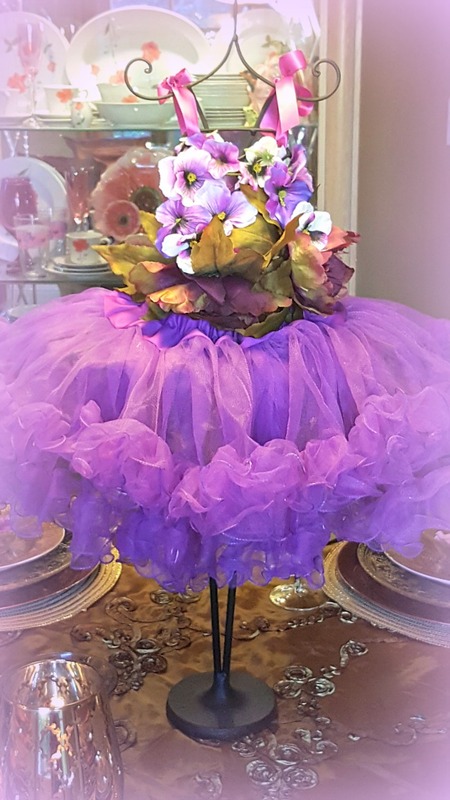 I dressed this small dress form with a purple tutu and flowers. I tied purple ribbon where the shoulders would be. I do enjoy using tutus for centerpieces, along with my trusty pillow cases. A very rich and regal look with all of the gold and purple. 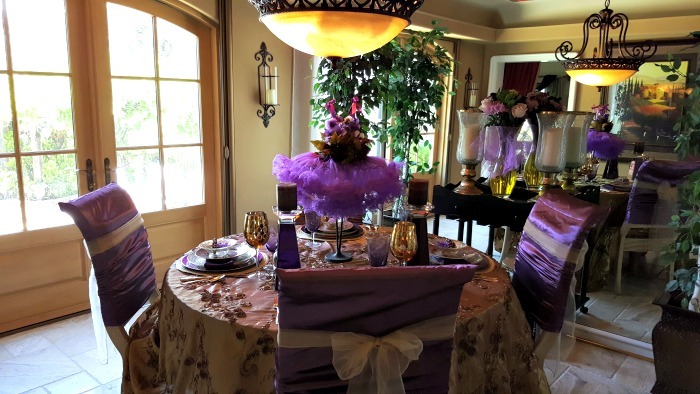 Purple pillow cases on the chairs with gold sashes. Fresh flowers for Mom, flanked by two tall hurricanes. 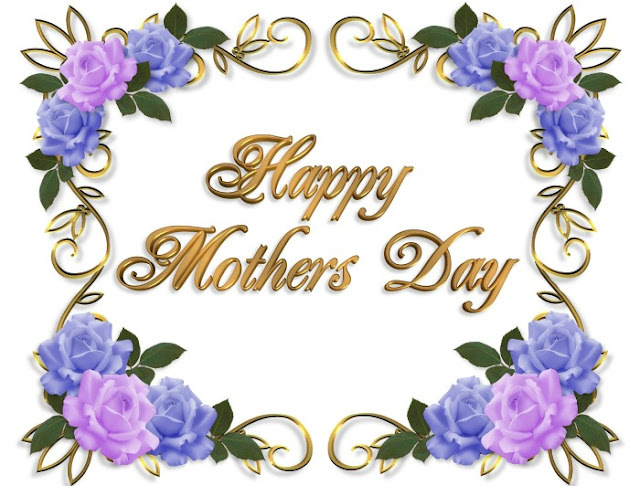 I hope each and everyone of you have a wonderful Mother's Day. Good Morning Linda, your table settings are always a joy to see. I love your centre piece, the little tutu is so lovely. Your cutlery is beautiful and the tablecloth is very special. Can you tell I love your table setting. You certainly are the Queen of table settings. I'm so pleased to hear your father is slowly recovering from his surgery. 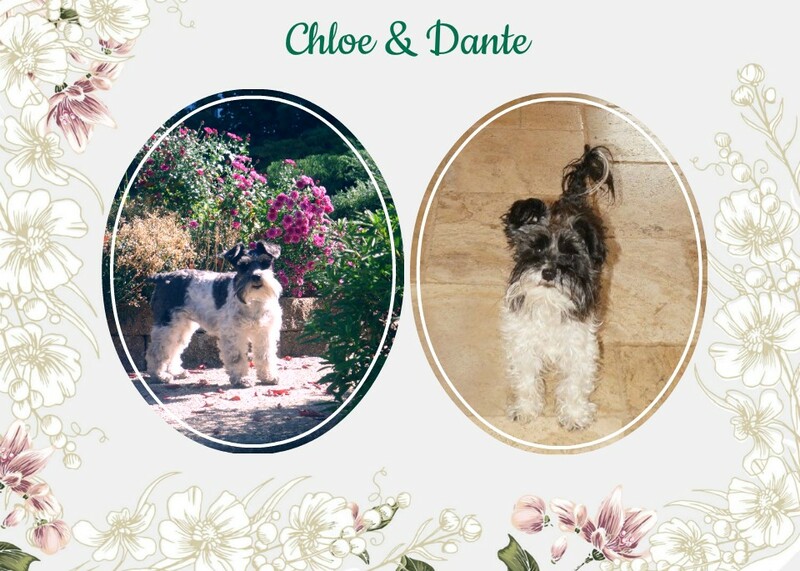 Have a wonderful Mothers Day with your family. I know you LOVE her..you have demonstrated it so lovingly! All I can say is WOW! That is one regal table!! Any mom would indeed feel like the Queen! And your menu sounds incredible too! 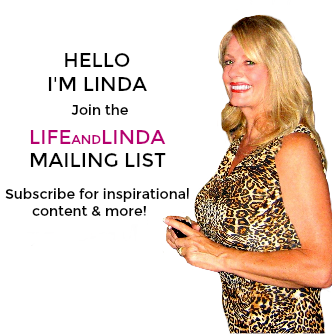 Thank you for all the eye candy Linda! So pretty... Happy Mother's Day Linda! The tables are so wonderful and the menu is so yummy!!! What a festive and creative table setting! I've never seen a centerpiece like that before. You've thought of every detail. Your menu sounds delicious! 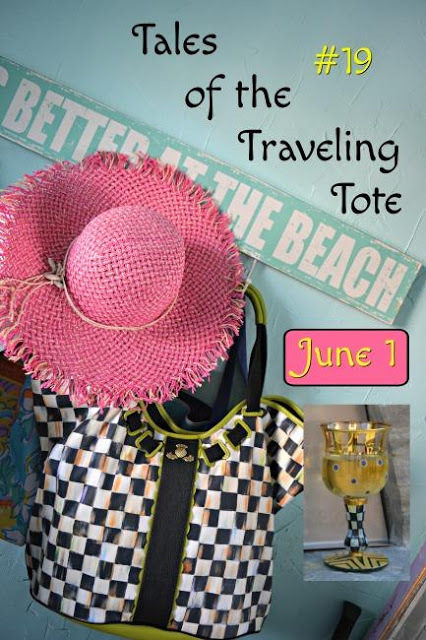 Have a wonderful mothers day weekend! Your Mother's Day brunch menu sounds delicious! Good thing I don't know where your parents live, or I'd be crashing that party for sure! 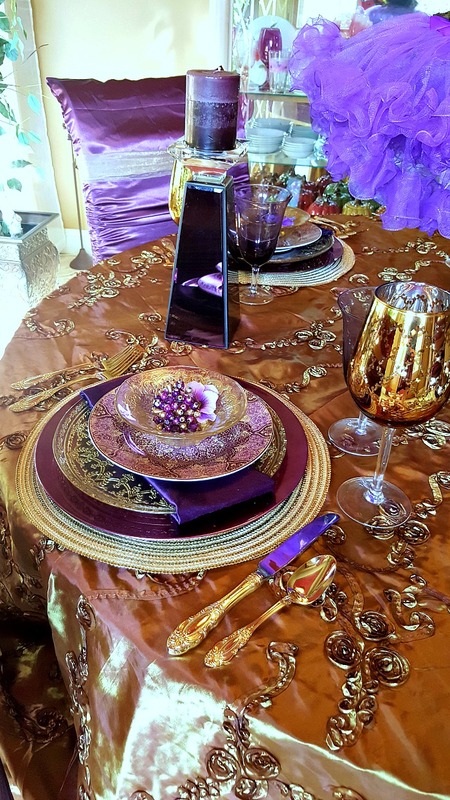 Purple and gold were my high school's colours, so I enjoyed this table setting, lol! 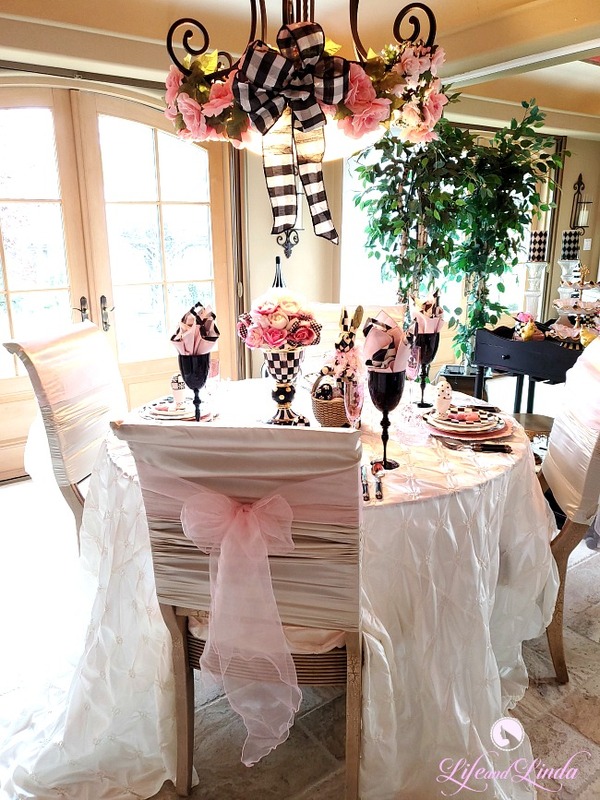 Your table is "tutu"cute, Linda!! I want to come over for your brunch on Mother's Day, for your menu sounds perfect. I hope your dear dad will be feeling better soon. Happy Mother's Day to you and your darling mom! Your table is amazing Linda! I would love to sit down for a nice meal and take it all in. 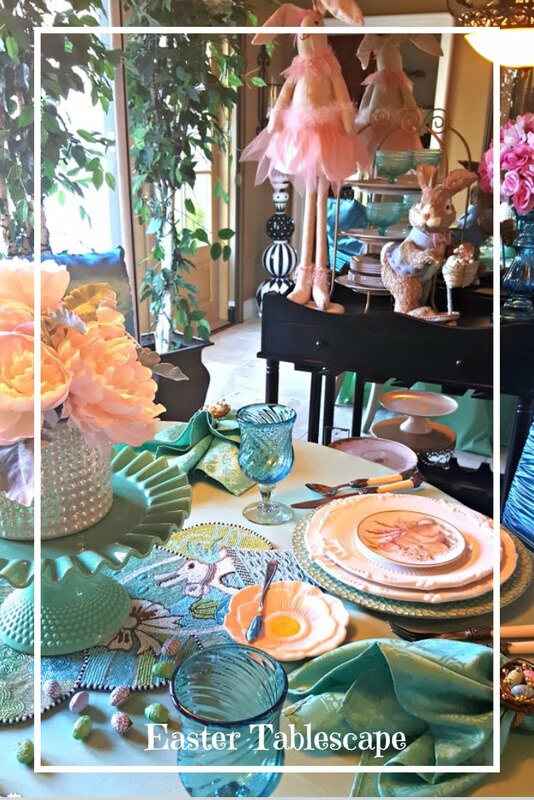 I love the tutu centerpiece. 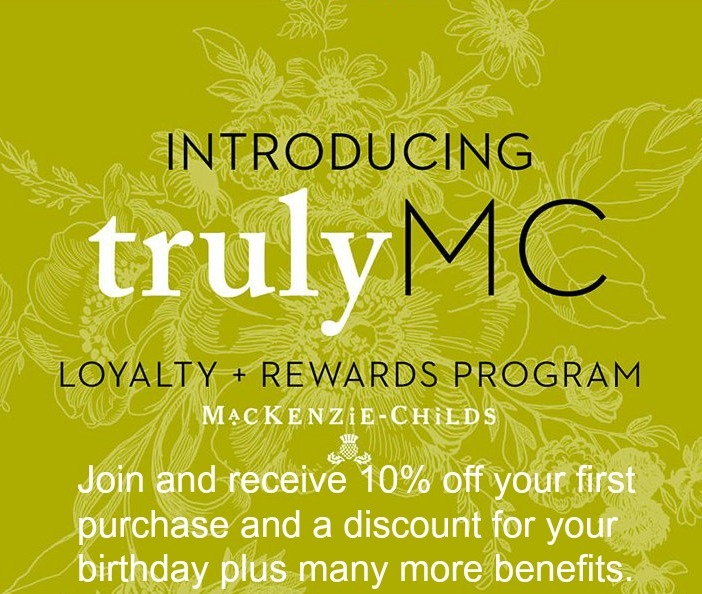 What a great idea to celebrate Mom. Every detail is perfect as always. Happy Mother's Day! 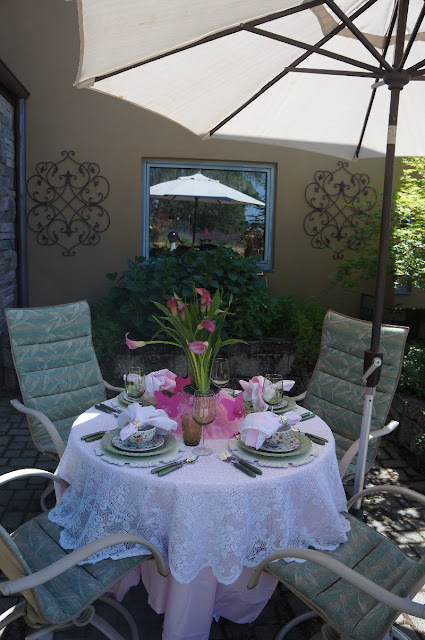 Yes, you did set a pretty table, Linda! In fact, it's gorgeous! 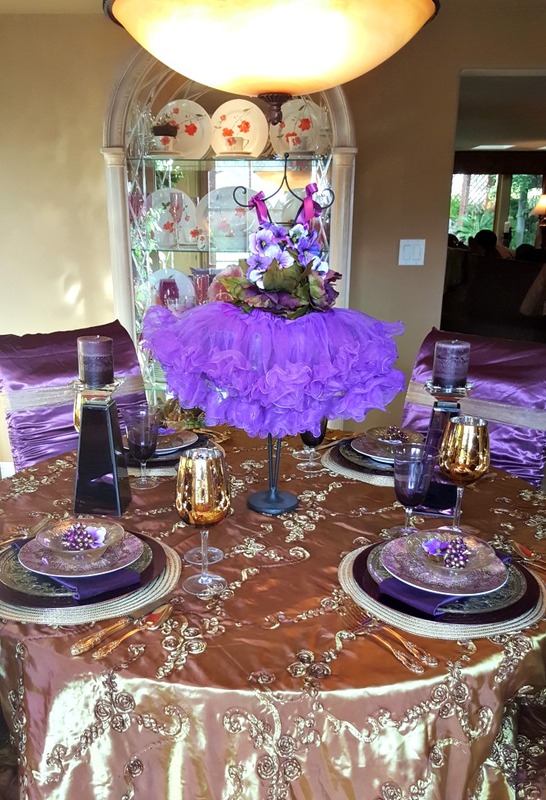 You know I love all the purple and glitz, but the tutu you created is absolutely stunning! I see where you get your looks from - your Mom looks lovely and I hope your Dad is recovering nicely from his surgery! Happy Mother's Day, Linda! Hello Linda, your table is very nice and chic!! Enjoy your day with your parents. 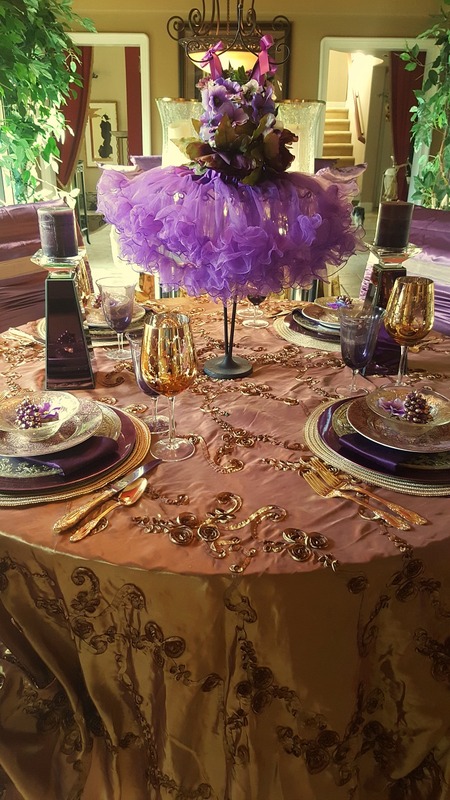 Your table is definitely regal with those deep purples. The tutu centerpiece is cute and very clever. Happy Mother's Day! 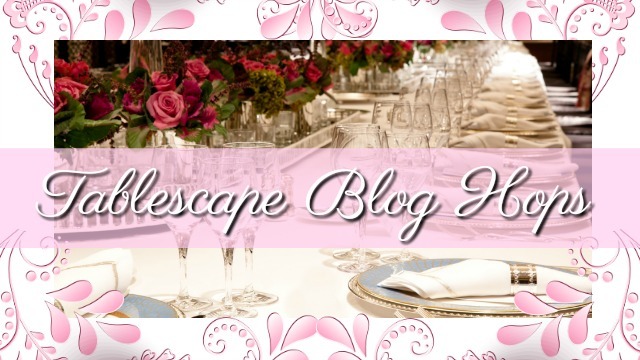 Really love this gorgeous table setting, fit for a queen! 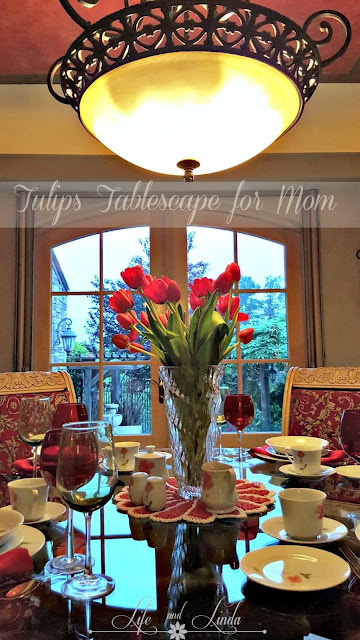 Happy Mother's Day..
That is a beautiful table setting for Mother's Day Linda. I hope you had a lovely time celebrating at your parents house. A lovely table, Linda. 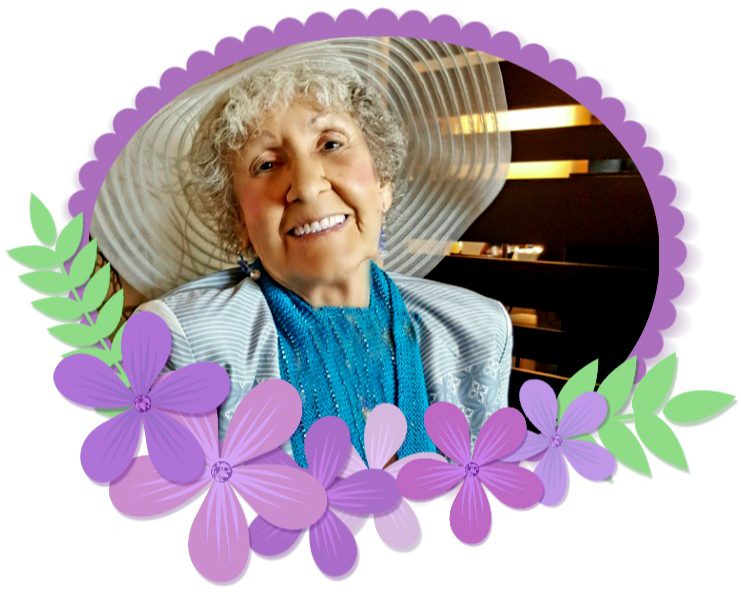 I hope you had a wonderful mother's day. I love that table clothe. The pillow cases are so clever. Glamorous and regal table. Lush fabrics and great texture and color. Happy Mother's Day to you and your Mom a little late. Your menu sounds great. Glad your Dad is improving.